For this line, the time is relatively abundant. 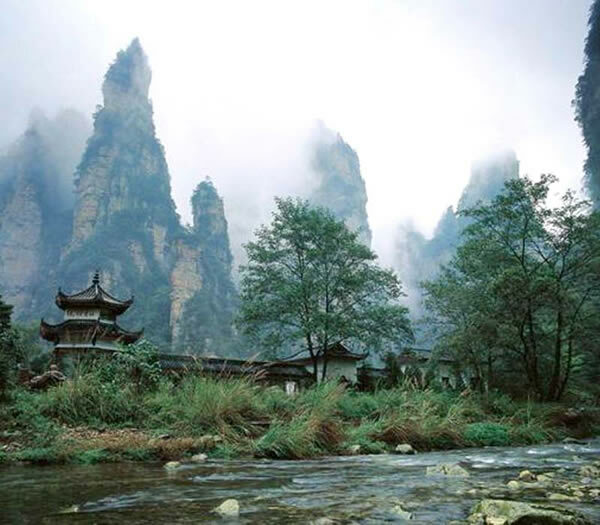 And this is the first choice to visit the Zhangjiajie and the Phoenix Town. 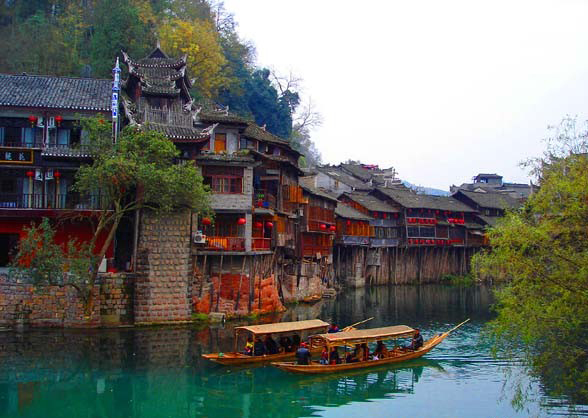 You can visit the most essential and the most famous scenic spots in Zhangjiajie and Fenghuang! In the morning：The guide or driver will pick up you in Zhangjiajie airport or in bus station or train station or in hotel where you live. The travel car will go to the first national forest park―The National Forest Park of Zhangjiajie. It needs to take about 40minutes by car arrive there. The entry fee is 245RMB/P plus 3RMB/P insurence fee. After we enter into the park, we can see the big oxygen bar square( including 8-10 million negative oxygen ions per cubic centimeter of air). When we land at the altitude of 1200 meters, we can see the biggest sightseeing stand in Zhangjiajie. And then we will visit the Yellow Rock Village scenic area. We can choose to take the cableway up and down and can also walk up and down. If you take the cableway that needs to take 65RMB/P one way and 118RMB/P round and you need to buy the cableway ticket by yourself. Yellow RockVillageis the most important spot in Zhangjiajie National Forest Park. It was highly praised by a famous poet: “It makes us surprised in five steps, astonished in seven steps and shocked in ten steps.” And now, let us enjoy the beautiful. Walk along the way, we can see the Six Wonders Pavilion, the Star-Plucking Terrace, the Five Fingers Peak, the Natural Mural, the Echo Wall and so on. In the morning：After the breakfast, we will take the car and go to the Biaozhi Gate of Wulingyuan, and then we will go to Yuanjiajie about 30minutes by the environmental bus. And then we will take the biggest elevator in the world--Bailong Elevator. (Please attend: some small traffic vehicles which are not included in the arrangement, it needs to pay by yourself. The Bailong Elevator needs to take 72RMB/P one way.). Or we can go to Yuanjiajie by foot. And then we will visit the Heaven Column, which is the prototype of the Hallelujah Mountain in the movie of Avatar and we can see the nature stone bridge―The First Bridge in the world. (The absolute height of the bridge pier is 354 meters. )、Eight Diagrams Pictures and so on. And then we will take about 40minutes by the environmental bus and go to the Tianzi Mountain for visiting the surprised peak.Tianzi Mountain was ever named as “the king of the peak”. Thousands of mountains stand in the clouds. We can see many other scenic spots, for example, the Tianzi Pavilion, the West Sea Stone Forest, Helong Parkand so on. In the afternoon：We can choose to walk down the mountain. (Generally, it needs to take about 2hours by foot.) Or, we can choose to take the Tianzi Mountain cableway to down the mountain. (It needs to take 72RMB/P one way and you need to buy the ticket by yourself.) In the bottom of the Tianzi Mountain, we will visit the Ten Miles Gallery scenic spot. In the Ten Miles Gallery, we can sight it by foot that needs to take about 1hour. Or, we can take the sightseeing train. (The train is 38RMB/P one way and you need to buy it by yourself.) Along the way, we can enjoy many attractions, for example, the Three Sisters Peak, the Old People of Gathering Herbs, the Tigers Roar to the Sky, the Xiang King View the Book and so on. And then, end the trip today and we can back to the hotel and act freely. In the morning ：After the breakfast, we will take the travel car and go to the “Underground Pearl”―Yellow Dragon Cave scenic area. 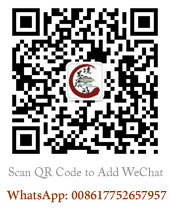 (The ticket is 100RMB/P which is included. It takes about 2.5hours to visit it.) Yellow Dragon Cave enjoy the reputation of " champion cave of world tour”. In 2005, the Yellow Dragon Cave was named “the most beautiful tour cave in China”. There are many lights in the cave. Day or night, without fear of rain or wind, all year long, you can delight in its wonderful scenery. 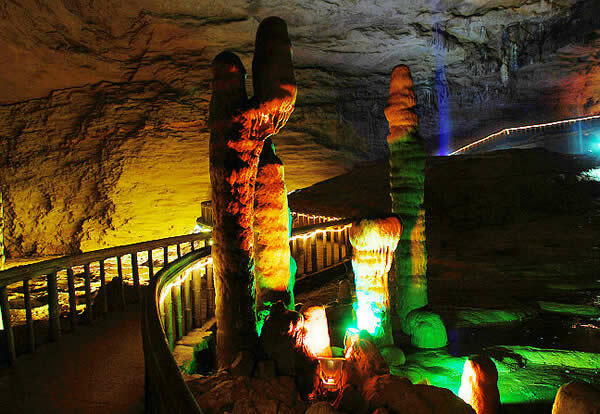 The cave is of good beneficial air circulation, and is cool in the summer and warm in the winter.Yellow Dragon Cave is one of the foremost scenic areas in Zhangjiajie, and was rated as one of the first 4A National Tourist Attractions in China. Also it has been honored as magical karst cave both in China and in the world. In the afternoon： After the lunch, we will back to Zhangjiajie city. And then we will go to the PhoenixTownabout 3:00 P.M. It needs to take about 5hours by travel car. After we arrive, we can act freely and enjoy the nightscape! In the morning：We will visit the nine scenic spots of PhoenixTown. The tentrance fee is 148RMB/P. We will sight many beautiful attractions, for example, Shencongwen Former Residence, Xiongxiling Former Residence, Wanshou (Longevity) Palace, River Rafting, East Gate Tower and so on. Phoenix Ancient City is a glorious place. Situated in the western border area of Hunan Province,Phoenix Ancient Cityis a famous historic and cultural city. It was ever praised as "the most beautiful small city inChina" by Rewi Alley, a renowned author inNew Zealand. In Phoenix Town, classical characteristics can be found everywhere, including streets paved with bluestone blocks in the city, Diaojiao Buildings at the riverside ect. In the afternoon: Drive about 4 hours back to zhangjiajie . We will arrive at Zhangjiajie about 6P.M. and thenm finish your pleasant trip!